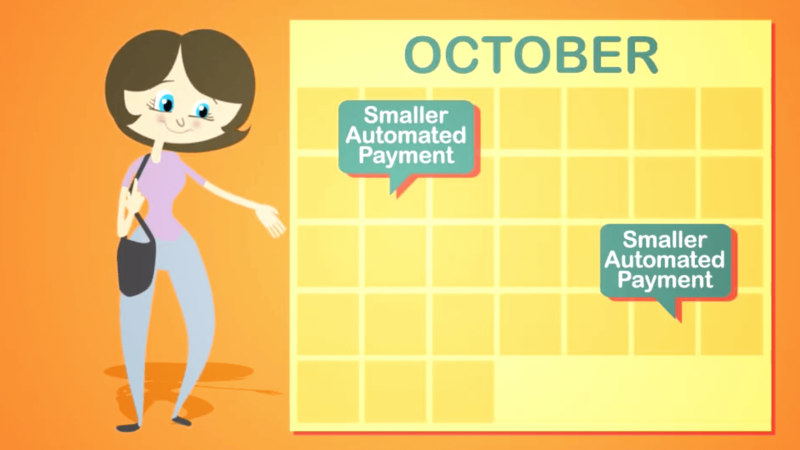 Smaller automated payments are fast, easy, and eliminate the need to write and mail checks. Simplify your budgeting and improve cashflow. Home mortgages up to 7 years faster. Auto loans up to 8 months faster. Paying off your loans early reduces interest charges* and eliminates the risk of late fees. Own your car or home sooner, and own more when you sell or trade. Electronic payments are much safer than writing a check. Less paper saves trees, and less mail reduces carbon emissions. They should call this the EASY plan because it makes my life a lot easier. Paying my bills and making it between paydays is so much easier with smaller bill payments that happen automatically when I get paid. We love SMART Payment Plan. So easy and hassle-free. We are using it for our mortgage too. I am always so busy that paying my bills is the last thing I want to think about. My dealer offered me SMART Payment Plan when I bought my car. They help me make my payments on time and I'm paying my loan off sooner. Thank you! The Smart Payment Plan helps me pay my bills on time without having to worry of late or missed payments. It's simple and easy to use. The best part of it helps payoff bills early. SMART Payment Plan has made a huge impact on my personal and business life. SMART has made my life simple and I have zero stress about traveling or getting busy with family, work, etc. I never worry about any of my bill being due or being late - it's so easy and convenient! I love SMART Payment Plan. I travel a lot and they take the stress out of paying my bills! Thank you SMART Payment Plan! I recommend Smart Pay to all my friends. Thanks to them we saved money by paying car off early. It really helps you manage money wisely. The Smart Payment Plan has been an outstanding asset to me. I've been able to pay-off over $20,000 in car payments without any stress or emotional pressure. My payments were automatically made for me without the worry of remembering dates or having late fees. For anyone who feels overwhelmed with debt, I strongly urge them to avail themselves of this company. One's stress & concern about debt will be alleviated. This is a great service and it really helps me manage my budget. I have not been late on a payment since I signed up. I use them for my house, car and school loan payments. It's so much easier to have smaller payments that match my paydays. Over four years and have never had a problem. I love it. This is the first time I have used your service , it works great for my budget. Thanks Smart Payment plan. Keep up the good work. Great way to break down the monthly bills. IT helped me set a budget me and my wife could afford. I've been using them since November 2011 when we bought our Accord. Now, I have them pay my car, home, cable bill and credit card. Makes my life so easy and now I have less things to worrry about. Love, Love, Love it. I've been with them for years!!! They are awesome!!! Mr. Wonderful says make a plan to accelerate principal payments on your mortgage, student loans and credit cards.